UV Disinfection | JCI Industries Inc.
Primozone - Ozone Water Systems- Maintenance free and easy to operate ozone generators thanks to a unique energy saving and modular plate reactor technology with built-in redundancy. Provides lower CAPEX and OPEX compared to the conventional ozone generating systems. 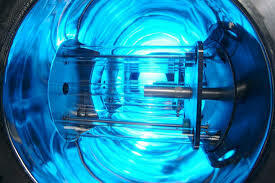 Only maintenance is a yearly inspection - NO time consuming cleaning of the reactor is required. Capacity turndown and total energy consumption is nearly linear where if operated at 10% capacity, the energy consumed is 10% of max capacity. This compares to competitor technologies if at 10% capacity still consumes approximately 80% of max energy. Primozone uses 50% oxygen compared to a traditional ozone generator. Primozone's oxygen consumption will vary according to the ozone production where traditional ozone generators have a constant oxygen flow independent of the amount of ozone produced. 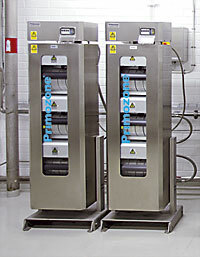 This results in 50% energy savings with Primozone! Ozone is one of the strongest oxidants and disinfectants used in treating water and wastewater. Used for removal of taste/odor, color, turbidity, reduced metals, inorganic compounds (iron, manganese, sulfide) total organic carbon (TOC) and chlorine disinfection by product (DBP) precursors. 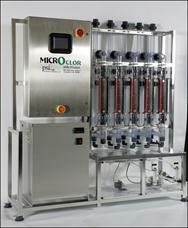 As a disinfectant it inactivates viruses, bacteria, E-coli, Giardia, Cryptosporidium. 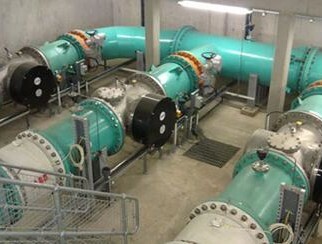 Evoqua ETS UV Technology is used disinfect the municipal wastewater before discharge into a water source. The ETS-UV™ system uses a closed vessel approach, which means greater operator safety, a smaller footprint and easier for plant staff to maintain. The enclosed approach is quickly gaining favor over the older open channel UV systems because of reduced operating life costs and greater operator safety. The UV chamber is fabricated from 316L stainless steel and contains an automated wiper system that keeps the quartz free from fouling. The chamber also features an access hatch that makes routine maintenance much easier and convenient for operators. Each chamber contains either low pressure/high output or medium pressure lamps which can be removed with effluent in the UV chamber. The lamps use the Twist-LOK lamp connector for ease of connection. Municipal plants often achieve a two years of lamp life for low maintenance and operational costs.